In 1908, the Bartholomew Museum of Antiquities organised a sale of many of its esoteric items to support the construction of a new wing to house the recent acquisition of a series of Roman statues. 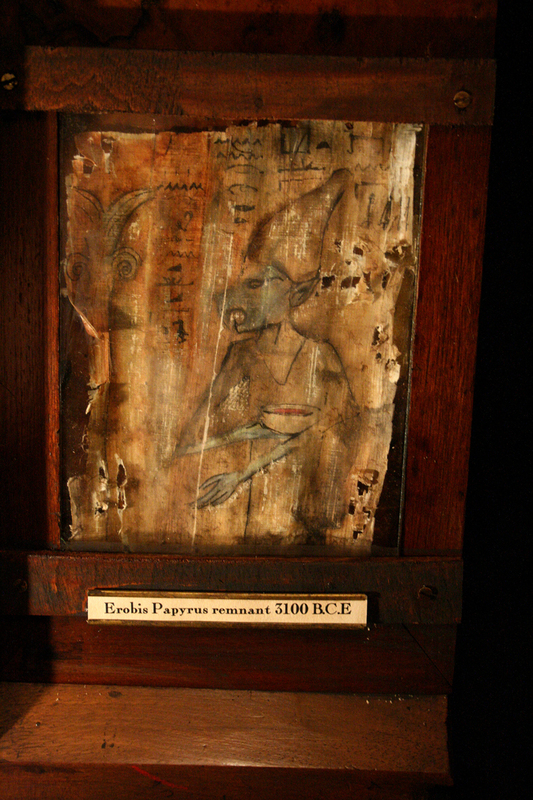 The piece that caught the eye of two gentlemen at the auction was a recent Egyptian find – the mummified remains of an early pharaoh. One of the gentlemen whose interest was piqued went by the name of John Cornwall – a farmer from Leeds, who had come into a small fortune after excavating what appeared to be the ruined entrance to an ancient unknown subterranean civilisation in the corner of his north field. “There is little known of early reign of the pharaohs. What little can be gathered from the plundered tombs of these majestic dynasties presents us with a plethora of monarchs, both male and female. In many if not all counts, the king is viewed as an incarnation of Horus, a falcon god, and the posthumous son of Osiris, who himself was a divine king slain by his brother, Seth. Horus fought his uncle for the return of the throne, and part of the accession process of the king was the proper burial of his predecessor, as Horus carrying out the last rites of Osiris. In fact, there are a number of cases where such an act may have been the legal basis for a non-royal figure’s ascent of the throne. One such king, the child king, Menes, was the first king to be announced as the incarnation of a different god. The viziers of the mother of Menes, Haro, proclaimed that Menes was the earthly personification of Anubis – God of the Dead. Haro had been an enigmatic ruler, taking an unknown man as her husband, he is depicted as a pale skinned man, with the muzzle of a dog. Menes’ reign seemed cursed, he was not presented before his subjects until he was six years old. His courtiers were unknown to previous viziers and he was shunned by many, but under his rule, much blood was shed. For his roots lay elsewhere, in a place of shadows. In regards to the birth of civilisation, not all credit can be passed to those of northern Africa, and the cultures of Babylon and Sumeria. One other hidden culture dwelled in the twilight city of Thenis – those who had evolved from an early offshoot of man to become dependent on the flesh and blood alone, who carried this curse in their own blood – the grey skins, the haemophage – Vampyr. 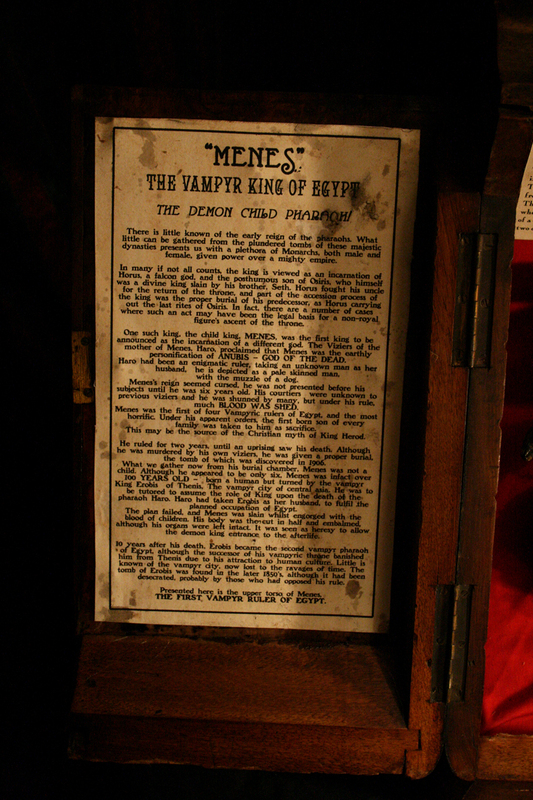 Menes was in fact the first of four Vampyric rulers of Egypt, and the most horrific. Under his apparent orders, the first born son of every family was taken to him as sacrifice. This was the source of the Christian myth of the deeds of King Herod. He ruled for two years, until an uprising saw his death. 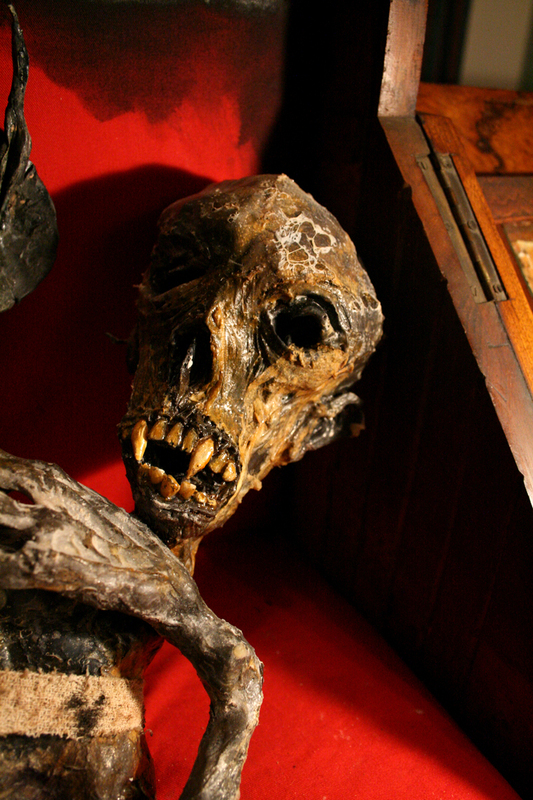 Although he was murdered by his own viziers, he was given a proper burial, the tomb of which was discovered in 1906. What we gather now from his burial chamber, Menes was not a child. 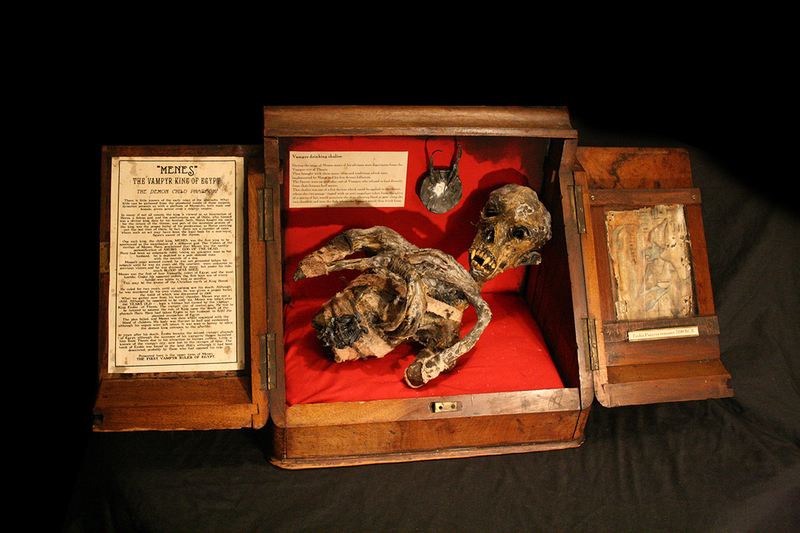 Although he appeared to be only six, Menes was infact over 100 years old – born a human but turned by the Vampyr King Erobis of Thenis. He was to be tutored to assume the role of King upon the death of the pharaoh Haro. Haro had taken Erobis as her husband, to fulfil the planned occupation of Egypt. The plan failed, and Menes was slain whilst engorged with blood. His body was then cut in half and embalmed, although his organs were left intact. It was seen as heresy to allow the demon king entrance to the afterlife. Presented here is the case exhibited at Bartholomew, complete with the descriptive plaques. 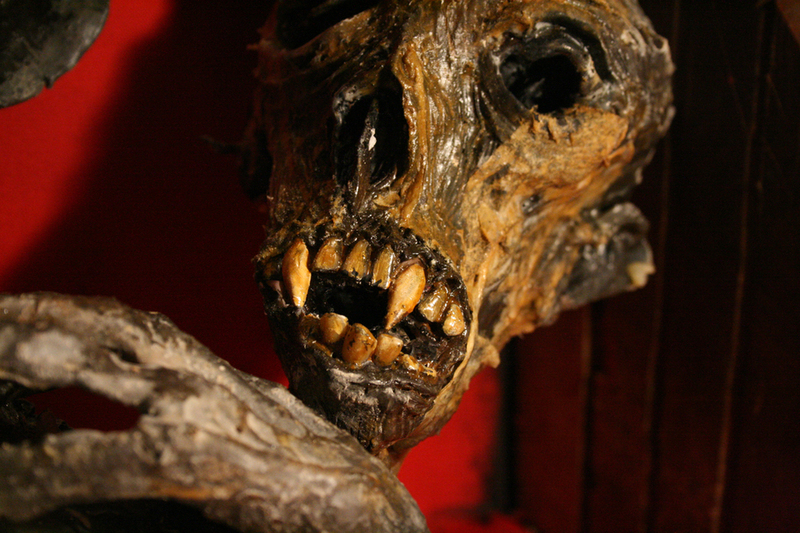 The mummy is severed below the waist. 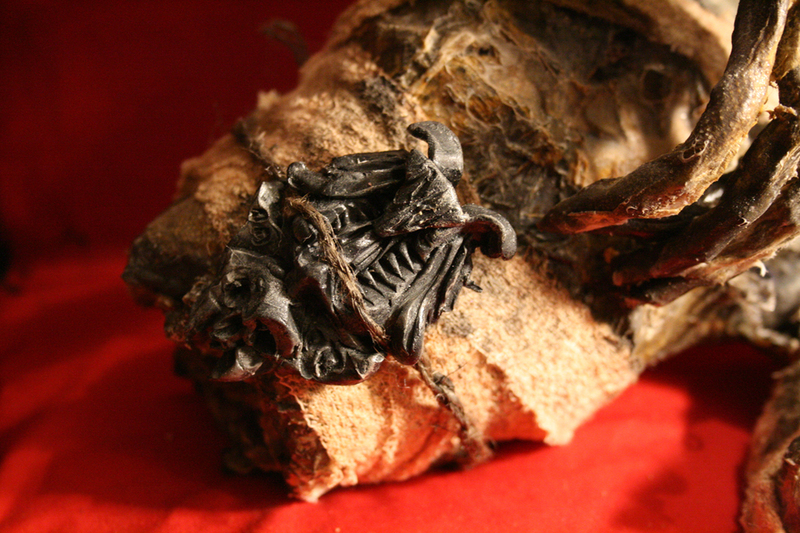 He is dressed in decaying burial cloth and has a black stone death brooch attached to him. He was found with various items, one of which is presented within this case; it is described as a drinking chalice. During the reign of Menes, many of his advisors were dignitaries from the Vampyr city of Thenis. They bought with them many ideas and traditions that were implemented by Menes and his devout followers. The “Dervot” were an orthodox cast of Vampyr who refused to drink directly from their human food source, seeing this lowly and primitive. 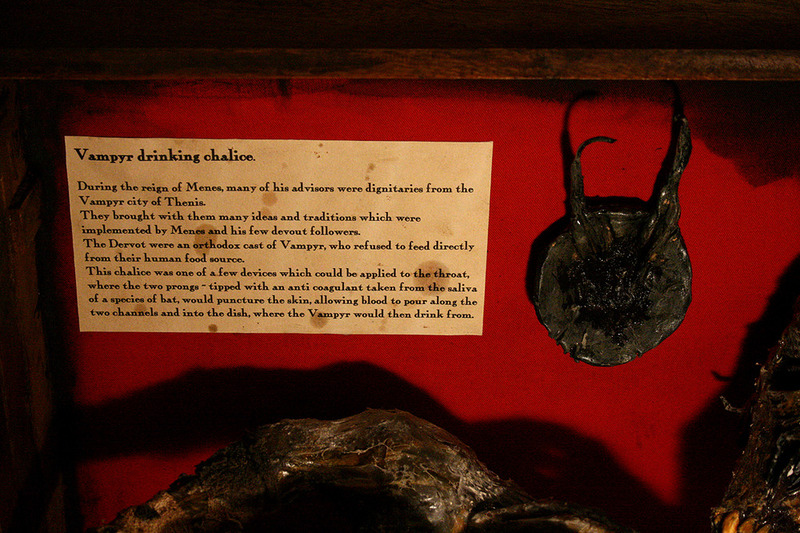 The device was applied to the throat of a victim, where the two prongs – tipped with an anti-coagulant taken from the saliva of Desmodus rotundus or the common vampire bat (which not only established the link between the animal and the Vampyr forever more, but also christened it) – would puncture the skin and allow blood to travel along the two channels and into the central dish where the victor could drink. Merrylin did not acquire this piece, as the price rose well above what he was willing to pay. 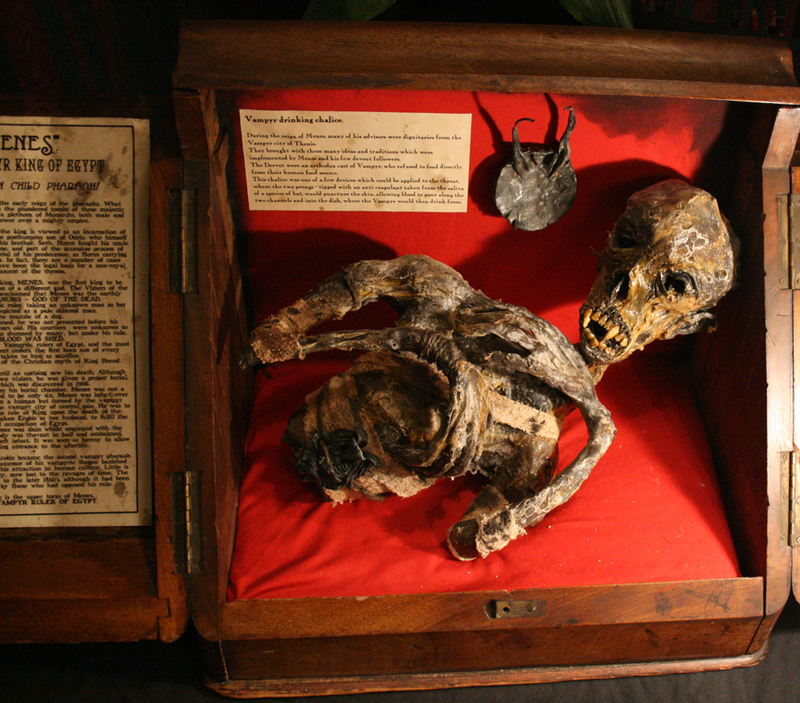 This auction not only saw the first cryptozoological item not to enter Lord Merrylin’s collection, but also the cause of a feud that lasted ten years between John Cornwall and Merrylin.